the next group of repair examples deal with larger cuts aka incisions. Welding of longer incisions with larger depth. The following use case is an excerpt from Indigo's handbook for the CWA . In section V. "Application examples", part A, several repairs without material tension are showcased. For this repair, you can use Indigo's replacement for Chinese "TPE glue", which actually is a Cold-welding TPE & TPR diffusion adhesive (CWA). This "TPE glue" alternative was developed by German company Indigo Individual, also known for a TPE repair kit, a stain remover and a magnetic M16 connector. The example below explains how to weld a short incision with larger depth. Incisions with a depth greater than 2cm are welded in several steps from below to the surface. This ensures complete welding at depth. 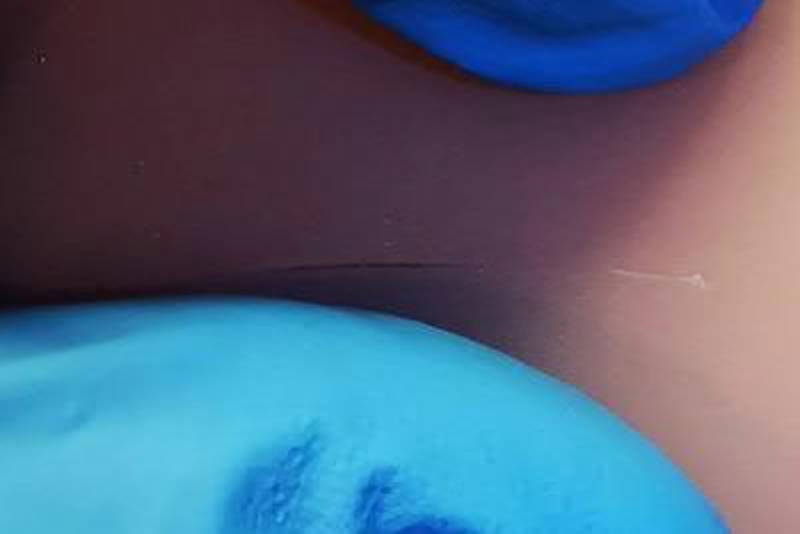 At the same time it is prevented that you would press out a larger amount of diffusion adhesive when closing the incision, because you can misjudge very easily in the amount of diffusion adhesive used at deeper incisions. With a brush, the diffusion adhesive is applied in the depth and distributed on the inner walls of the incision, until just before reaching the surface. The incision is completely welded in depth to just before the surface. The incision is then further welded as in the example "Welding of short incisions with small depth". The post-processing is carried out after the curing of the diffusion adhesive. This is covered in section VI. "Post-processing" of the handbook. Every customer will receive the unabbreviated manual as PDF file. This documentation is © by Indigo-Individual e.K., December 2018. All rights reserved.